In the spring and summer the bees are hard at work and if you stop by for honey I can give you a quick tour. The bees in the spring are typically very gentle as there is plenty of nectar. They will be very busy gathering nectar and pollen. You will see bees frantically flying in and out of the hives. WARNING: If you are allergic to bees, please respect the bees and the beekeeper and keep your distance. Bees returning to the hive are on autopilot and will bump into you if you get in between them and their hive. Or they will investigate people if they happen to be wearing flowery smelling perfumes or shampoos. Bees are vegetarians or vegan and will typically leave you alone unless they think you are a threat. Swatting at or blowing on bees stimulates their defenses and they will sting. Normally it is safest to ignore them. If you want to try keeping bees, it’s not that hard. Bees have been around for over 100 million years and know how to survive. Humans can provide a good home for them and the bees do most of the work. You will have to feed them replacing their carbohydrate stores if you want to rob them of honey. Bees are not for the faint of heart, you WILL get stung! They are not pets or domesticated in any way. They are wild animals and livestock to the beekeeper. Old lore tells us that bee stings can ease arthritis pains and some folks do get stung regularly. For a typical person the sting can hurt for a day. However, the human body will build a defense and after a while as you get stung it will start to feel similar to a mosquito bite overtime and will be a lot of fun to scratch when it starts itching. Beekeeping does have some initial investment and getting started costs around $400+ for your first boxes, bee suit and tools. Bees will then cost another 100-150 depending on if ordering a nuc or a package. Order early in the year as bee dealers sell out early. However ask your friends and other local beekeepers for bees! Local bees are more apt be healthy and hardy and you will make a beekeeper happy. The best time to get your bees is in late May or early April here in the north east. Once you have bees be ready feed them frantically. Feed only sugar water! In the spring 1:1 sugar as this stimulates the queen to lay eggs and the workers to draw out comb. Feeding issues of some sort is what new beekeepers suffer from the most in my experience! 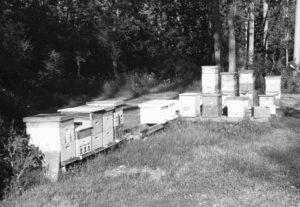 Two hives are the max a new beekeeper should have. You will learn how to interact with the bees and not get overwhelmed. Two hives will also provide some comparison on how the hives are doing. You may not get much honey the first year as a lot of energy goes into drawing out comb. Bees need up to 8 lbs of honey to produce 1 lb of wax so essentially between 8 and 10 lbs sugar during the first new hive feeding will be just so the bees draw out comb. The following year if your bees survive over winter you will get 20-30 lbs of honey per hive. Next year you could get 60-100lbs on average or a good year and super-duper bees you can get 120+ lbs! Expect to lose between 20-40% of your bees in the north east per year. This is natural selection and if you rob bees and do not replace carbohydrates for winter heat production the bees will starve and freeze. Bees are under pressure from all kinds of health issues. Bees need clean water otherwise they will drink from any available water source that may contain pathogens and you don’t want that near your honey. The green flat expanse of the tree barren suburbs supporting a monoculture of weed free grass brought to you by chemlawn that does nothing but kill and weaken bees. Mites are bee’s worst enemy. Imagine bugs the size of Frisbees on your body sucking your blood and infecting you with other diseases. Wax moths and African hive beetles live on wax and honey destroying the fragile comb matrix. Mice like to use the hives as shelter for over wintering and will eat the honey all winter long destroying comb. (If a good kitty is on security detail you will not have problems) Moving nectar from flower to hive requires energy so bees need to be fairly close to that energy source. The farther the bees need to fly to find a nectar source impacts the amount of energy the bees can store. My lawn supports a healthy ecosystem of life supporting wild grasses and I am very happy to see snowdrops and the random crocus in early spring, clover and dandelions in summer; my bees seem happy with it. Read about beekeeping on the internet and watch YouTube videos. I have killed bees and you will to. There are always veteran beekeepers about that are willing to share advice and war stories.